Im a Fan of Quality Auto Service... Are you? Fill in the below form and you can recommend ‘Quality Auto Service’ to a friend or family member via a text message. Show your support with a quick share of ‘Quality Auto Service’. The owners are very professional and ccourteous. Matt takes the time to explain everything to you and works with you, as these expenses are usually unexpected. Fast service, reasonable price,(can’t say great price, no car repair cost is great) and my car runs better than it ever has.I know nothing about cars and they made sure I understood what they were talking about. I wouldn’t take my car anywhere else. 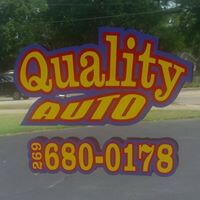 Quality Auto (Matt and Christina) is a great place to have all my vehicles serviced and repaired. They do the work well and charge less than any of the other shops around. They care about their customers and stand behind all the work done in the shop. I have been a exclusive customer since my first oil change. They have my whole hearted endorsement! I send everyone I know to them to get auto work done. The best place around for all your automotive needs. The best service! On many occasions they fit repairs in when they were already booked! Not only do we appreciate the great service I recommend them to all my friends! thay bin working on my cars for 10 plus years would not go anywhere else.